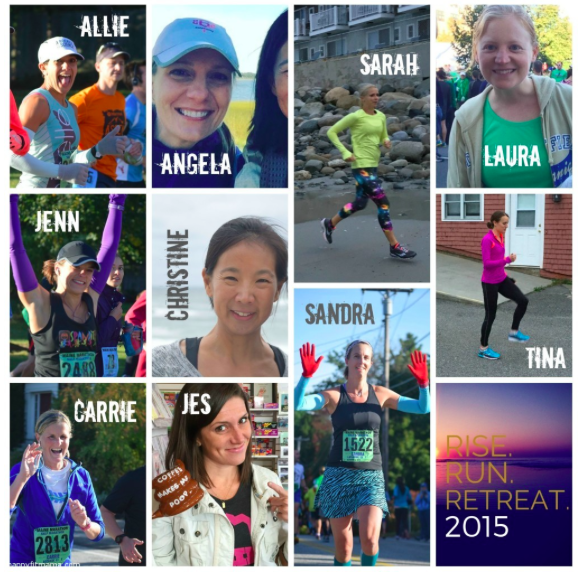 Last weekend I traveled to Southern Maine to the gorgeous town of Wells to participate in the inaugural Rise.Run.Retreat organized by Sarah and Jes. Sometimes it takes me a bit to digest how I felt about a particular experience. There were so many emotions and experiences packed into this weekend...I didn't even know where to begin! First and foremost, I am incredibly shy. On social media, I really do not come across that way. That is how social media can be misleading. 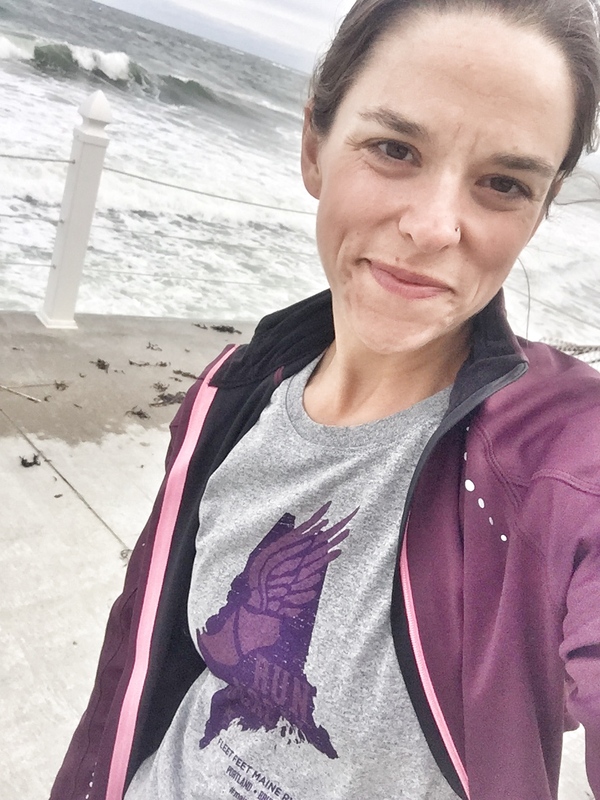 But at the same time, social media has been a positive way for me to meet so many other runners. borrowed from Jes --- thank you for putting together this great collage of all of us! 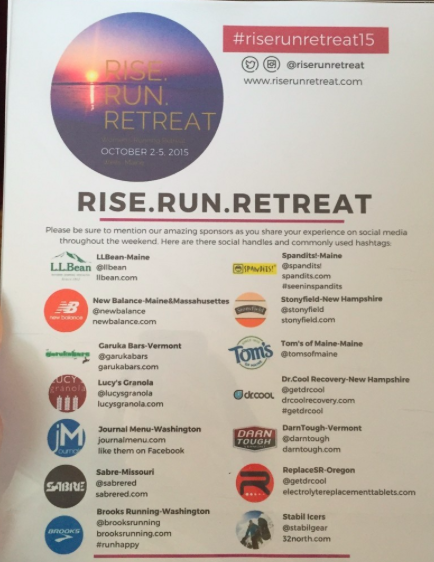 The Rise.Run.Retreat bloggers - seriously - FOLLOW THEM! Allie from Vita Train 4 Life, Sarah from Run Far Girl, Laura from Mommy Run Fast, Christine from Love Life Surf, Tina from Fuel Your Future, Carrie from Eight Crazy Soles, Angela from Happy Fit Mama, Sandra from Organic Runner Mom, Jes from Runladylike and myself. The retreat took place at Sarah's mother-in-law's beach house on Wells Beach. And by beach house, I mean seriously on the beach. No right of way walk down to the beach... I mean. This was the view from my bedroom. Amazing! And the sound of the waves crashing at night? It was a beautiful sound. It took a little bit to adjust to the sound, but seriously way better than the beeping noises I hear at 3am from the drilling and blasting business I have across the road. I'll take crazing waves any day! and this was what it's like at high tide! This weekend was a great way for me to (try to) come out of my shell and meet these great bloggers I've been following for years. I've even run in a few races with some of them, but never had the chance to meet them in real life ... until this past weekend! Finally! Shortly after arriving, we were directed to find out rooms. It was an easy find because our beds had our personalized LL Bean totes on them.... and those totes were filled with incredible swag! Then we gathered around in the living room with a delicious catered dinner and some great runner/blogger/girl chat. A very nice and relaxing way to end the day! We started out with dynamic stretching and a beach run. Tina walked us through some of her favorite dynamic warm up stretches. It was so cool going through an elite runner's warm up! I started out with the group, but my calf was not really liking it. So I stopped and walked with Christine and Angela. I'm happy I did because not only did I get to talk to 2 super sweet ladies - I got to snap this gorgeous photo of the group (minus Tina) on their return. And when we came back, we lined up our sand covered shoes and admired how cool it looked. I love the sea of colors in our shoe choices! Next up was yoga with Christine! A serious amazing experience! And then breakfast with Stonyfield and Lucy's granola. Yum! And then we got to meet Jeanine from Runner's Alley. I wish I lived in NH or even closer, because I would go to her store all of the time!!! She's a true inspiration! Shortly after that, we made the trip to USM for packet pick up. I got to check out some new Hoka's coming out this spring and picked up a new #runlocalbuylocal shirt from Fleet Feet! Later that night we made our way to the gorgeous little town of Ogunquit for pizza and we celebrated (a day early) - Sandra's birthday! And then we were given these gorgeous necklaces made by Lofted Designs. Absolutely gorgeous necklace! Race day! We left for the race about 6 am. The forecast initially called for rainy weather...which didn't surprise me at all since I tend to bring bad weather to races I run. Somehow a miracle happened and the weather forecast shifted to a cool start and absolute perfect running conditions! Like I said, it was a cool start to the day. I saw on Friday that the temps were going to be in the high 30's low 40's to start...so I went to the LL Bean employee store and grabbed myself a super cheap "throw away" robe. You might think I'm crazy... but seriously, it's the best thing to wear and so easy to just toss! Our group staying warm in the gym at USM. Such a great looking group of ladies, if I say so myself! Shortly after this photo was taken, we took off for a warm up jog, said our "good lucks" and found our places in the starting line. My normal race start pose when I see friends! See the guy in the back wearing my robe? Yeah, he's running with my friend, Amy. She made him put my robe on and she rocked her marathon! I want to be like her when I grow up! I'll be doing my official Maine Half Marathon post tomorrow - but you can tell I finished and found the ladies afterwards.... Carrie finished just a few minutes after this. She did rock her 1st half!!! I had an amazing experience with these ladies! I seriously learned quite a bit about blogging and running from them and will cherish the memories from this weekend. Thank you to Sarah and Jes who organized this event and to Sarah's mother-in-law for allowing us to stay at the most gorgeous beach house I've ever been to! And a HUGE shout out to all of the sponsors!